-I took HORRIBLE pictures during this meal. I was pretty incompetent at iPhone picture-taking in July hahaha. 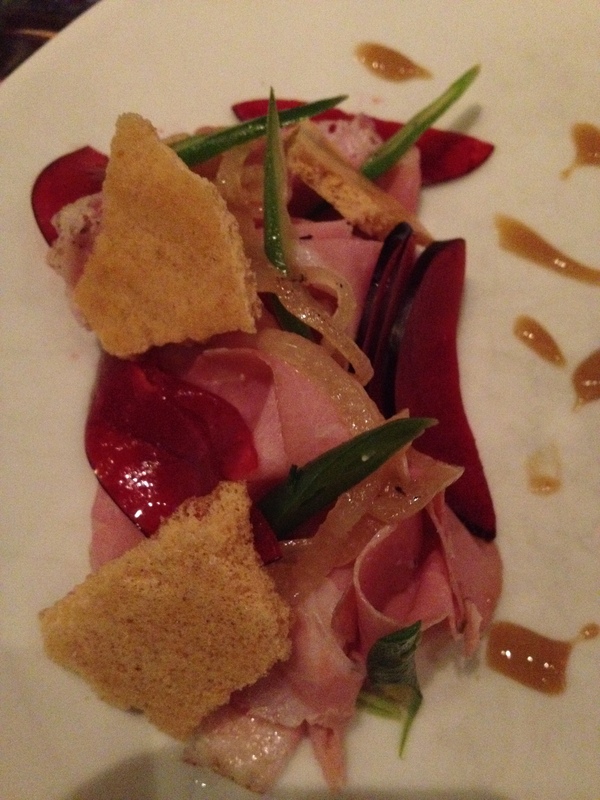 Monte: I think Wylie Dufresne is so creative and his food really made me think about flavor combinations. wd-50 was refreshingly casual and seemed to be all about the food. I really enjoyed just eating and not having to worry about whether or not I had a jacket. Monte: I think the flatbread chips are amazing. They’re light and airy but still carried a strong sesame flavor. Not sure if it’s more like a cracker or a chip, but it sure is addicting. 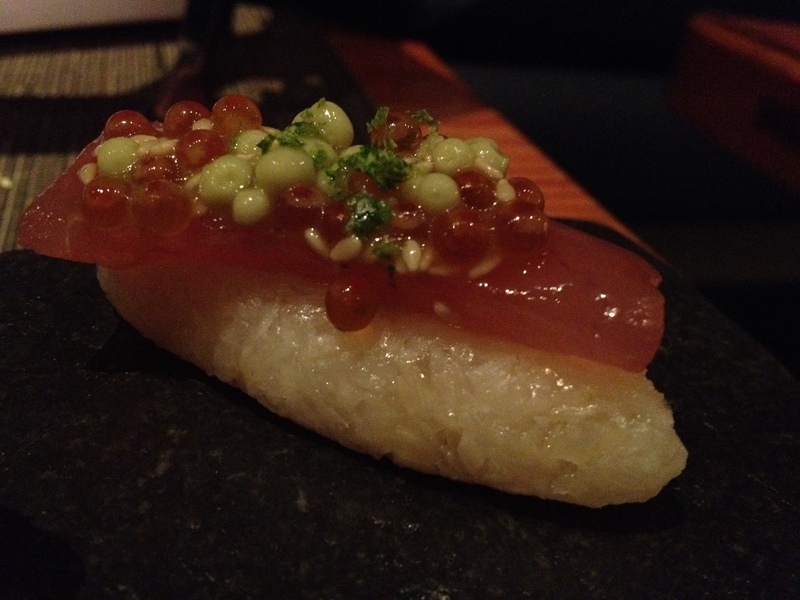 Monte: It tastes like a great piece of nigiri, but I knew the dish was more intricate than that. With more research on seriouseats, it turns out the orange pearls on top are trout roe marinated in classic ponzu, and the green pearls are cream cheese pureed with seaweed and spherified with agar agar. This is really technical and creative cooking, and there’s real a sense of wonder as a diner who’s not familiar with these advanced techniques. 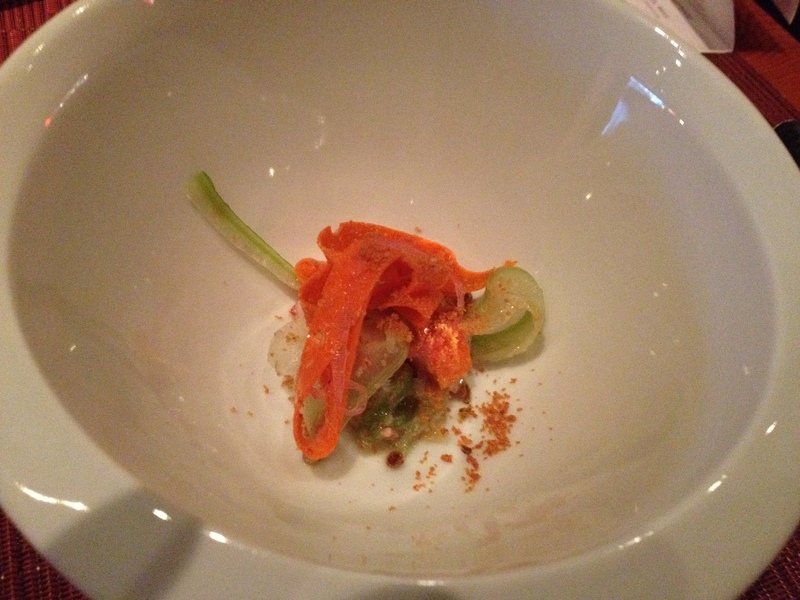 Monte: This dish was so light and fresh. I couldn’t really discern the different individual ingredients, but I got a pleasant play on acid and sweetness. I couldn’t tell what the orange ribbons were, I thought they were carrots cooked in a seafood-flavored bath, but turns out they were lobster roll noodles! Monte: The scrambled egg ravioli was really crazy. It tasted exactly as how it sounds, but yet it’s so intricately made. Just think about how to make a ravioli with scrambled egg as the shell. It sounds bizarre!! 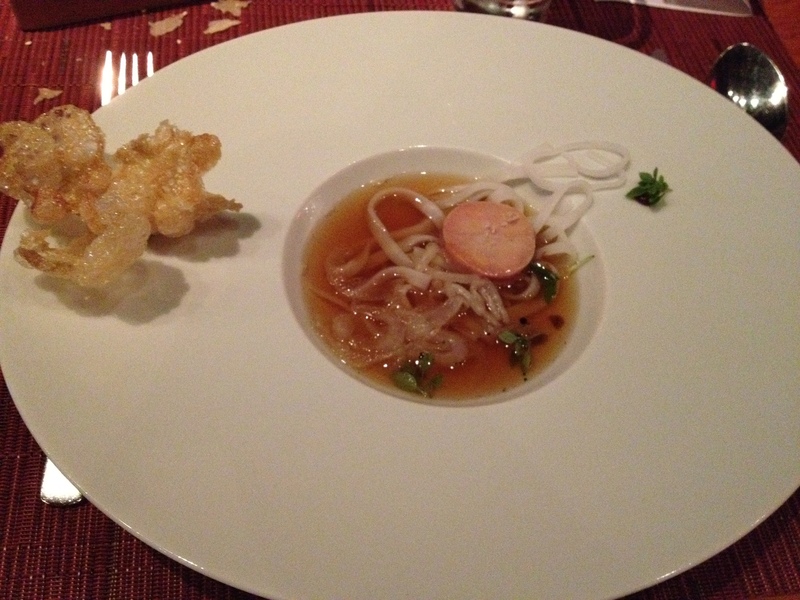 Monte: Pho is traditionally made from beef bones that are simmered with other herbs until you get a rich earthy broth. This broth was so familiar, and yet so different. 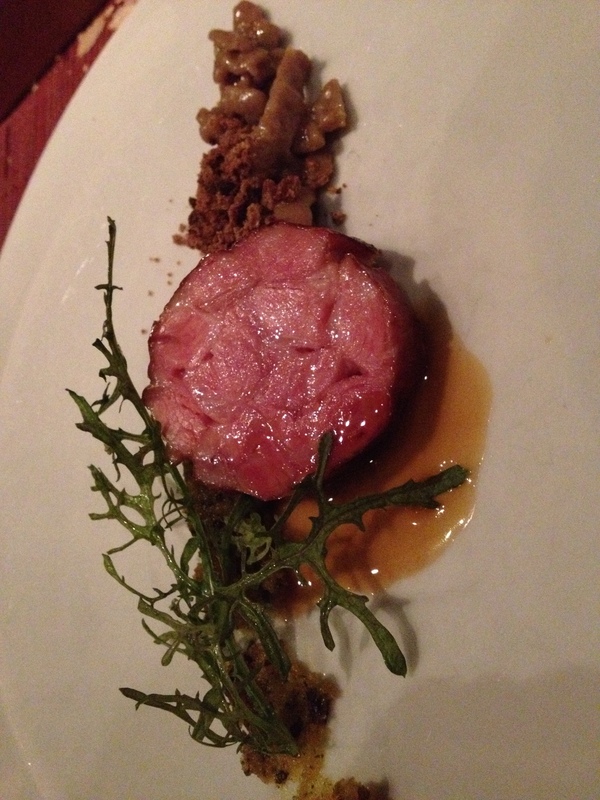 It has those same herbacious and earthy tones, but the individual flavors were so different. The foie is sweeter and more fatty, yet without any of the greasiness that sometimes comes with pho broth. 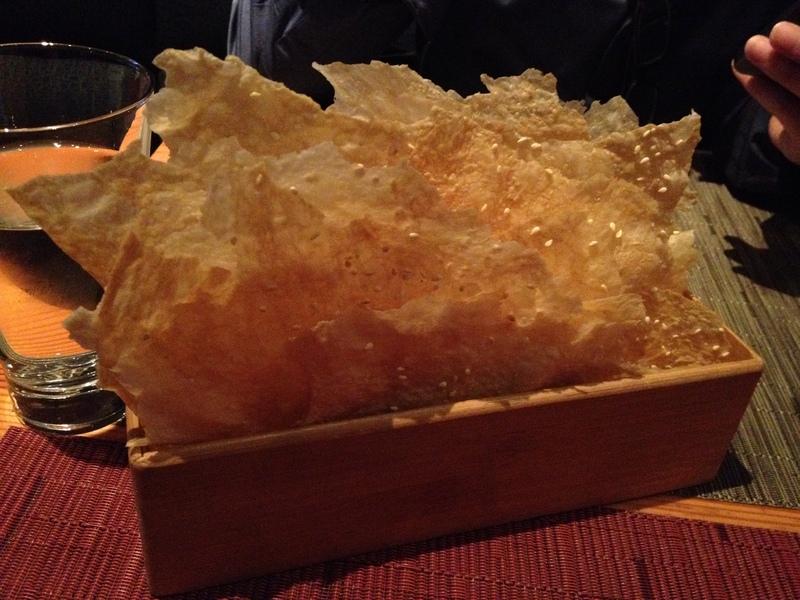 The beef tendon chips were a great crunchy savory bonus. Monte: It’s a great play on peas and carrots. 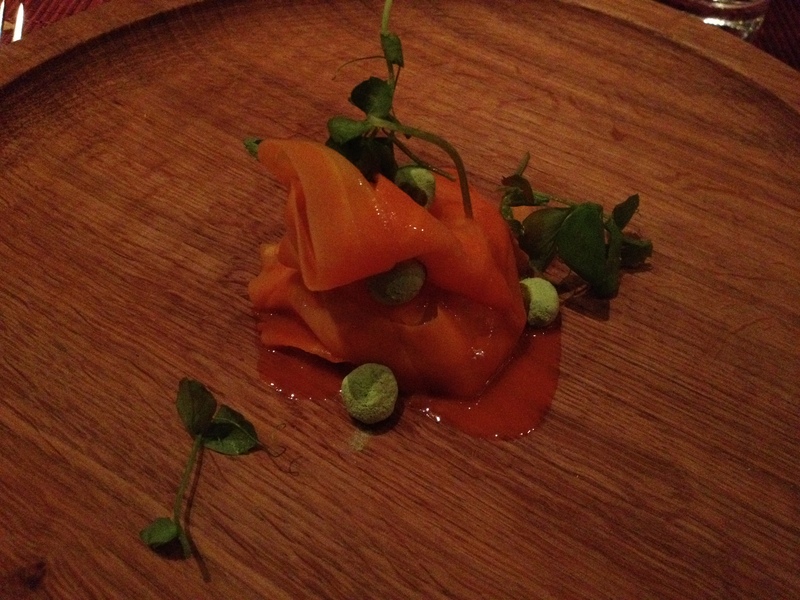 The paper thin ribbons of carrots were tender and sweet, whilst the “peas” were carrot balls covered in pea dust. Of course, everything was enriched by the creamy yolk, which is apparently a duck egg yolk cured for 6 hours in a salt, sugar, and amaro bath. There’s also a confit of chicken at the bottom. It’s a really complicated but fun dish. Monte: There’s a LOT of different components to this dish, but what I enjoyed most was the sweet spicy mustard that paired perfectly with the smokey veal brisket. Also, who the heck has ever made brisket out of veal?! 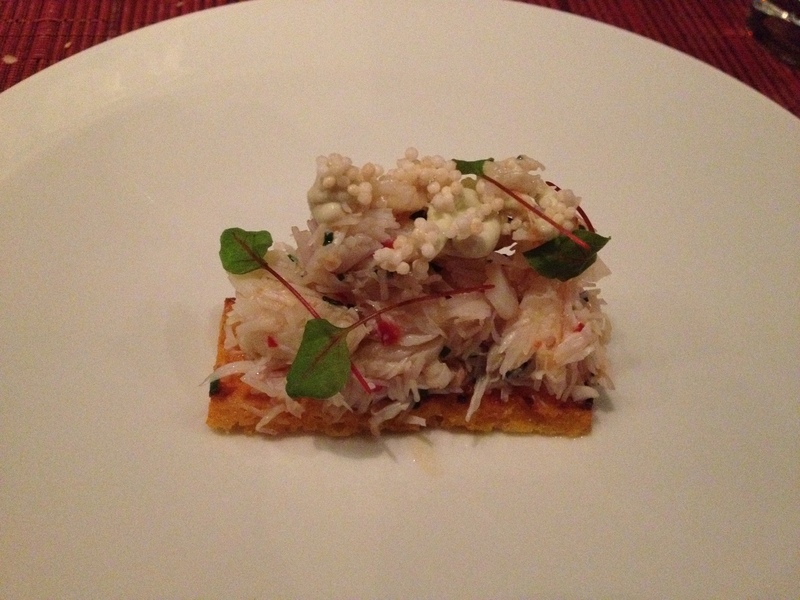 Monte: The subtle sweet crab worked well with the slightly sour kaffir notes, but what made this dish one of my favorites of the night was the saffron cake. It was so sweet, and yet almost floral. My description sadly understates how magnificent this dish is. 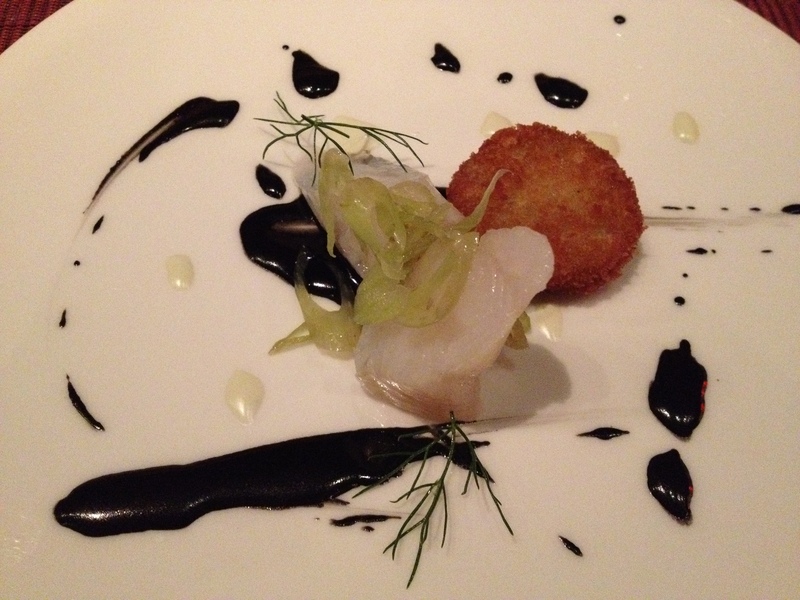 Monte: licorice and fennel aren’t my favorite flavors, but I think the dish excelled in the sense that it really made these two flavors very concentrated without overpowering the fish. 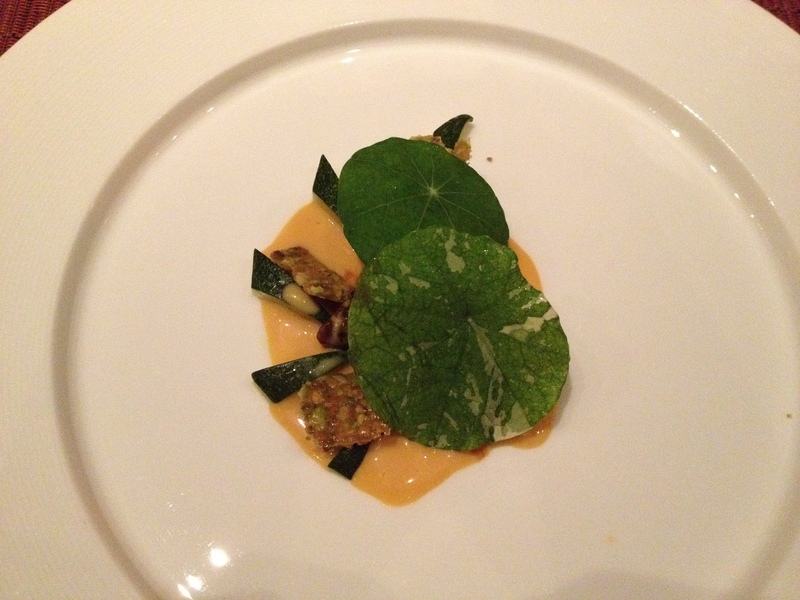 Monte: The zuchinni leaves hide the beautiful sweet pistachio crust that paired oh so well with the savory sweetbreads. Monte: Rootbeer and pork?!? This dish was incredibly flavorful. The pork was fatty and satisfyingly savory, while the sweet rootbeer sauce just lingered with an airy cinnamony aftertaste. 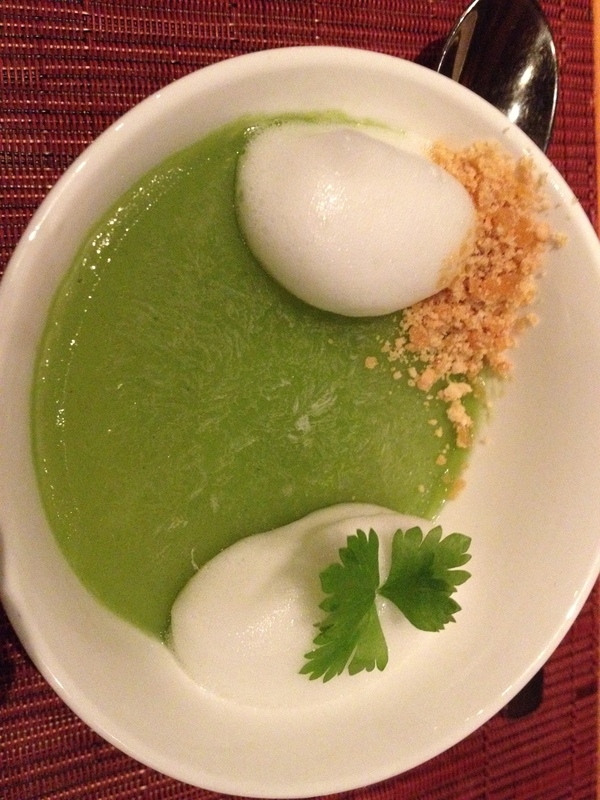 Monte: I don’t think you can ever go wrong with cucumber as a palate cleanser. 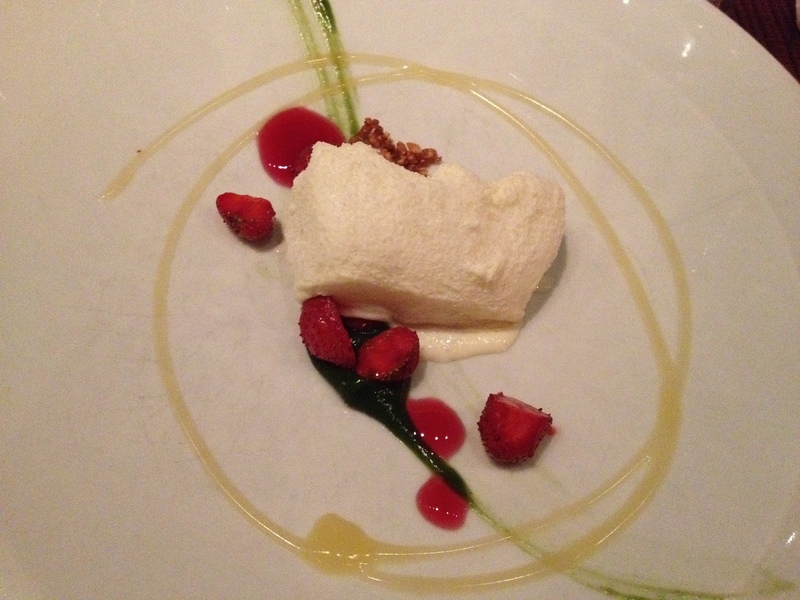 Monte: Yuzu milk ice tastes as light and yet creamy as you’d imagine. The ice cream deliciously dissolves at the first touch on the tongue. 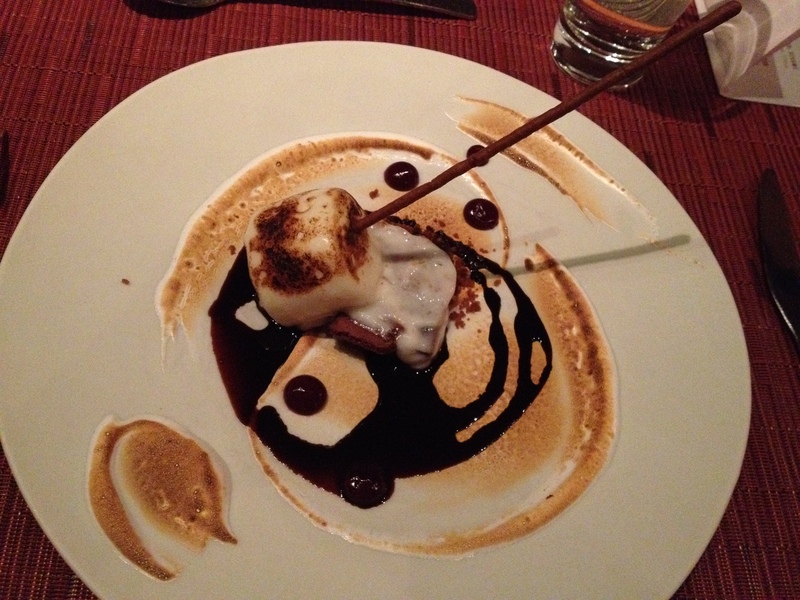 Monte: This was a great play on s’mores. The marshmallow is actually a meringue ice cream and the stick holding it was edible too! 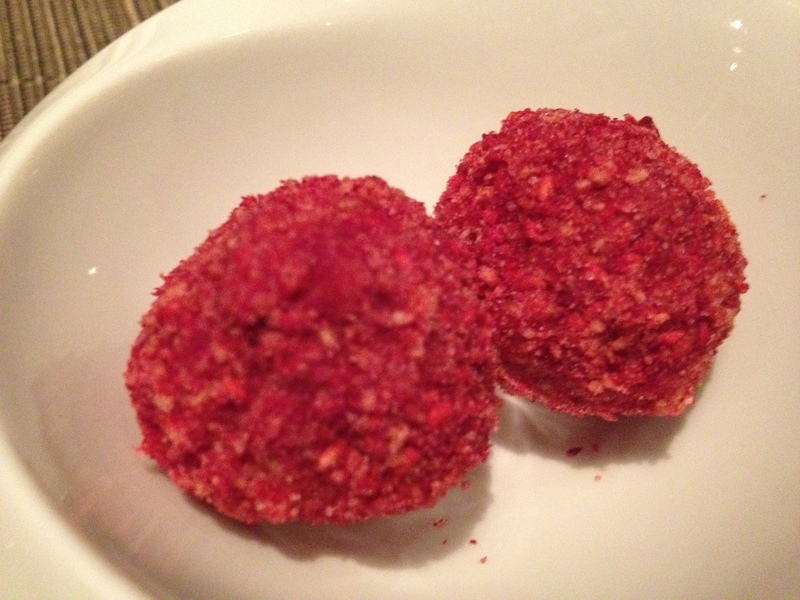 It’s really playful, and was certainly better tasting than anything I’ve ever eaten by the campfire. 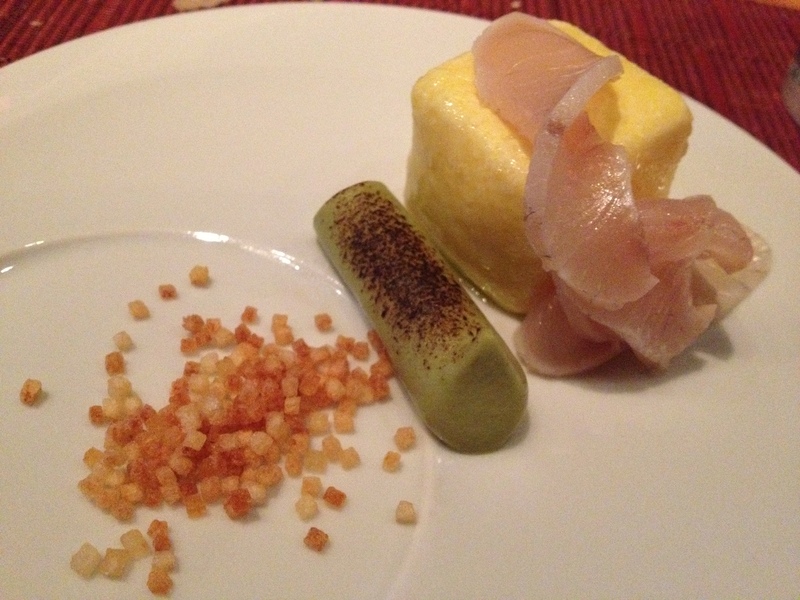 Monte: Writing about wd-50 just makes me want to go back. Everything was really creative, and I was guessing at every turn how things were made, of course having no idea. It’s awesome.